Findmypast user Theresa Green shares the shocking discovery she made about one of her ancestors in our newspaper archives. In my experience, a good genealogist is a cross between Miss Marple and Agent Scully from The X-Files (and in many ways that show's tagline 'The Truth is Out There' is equally applicable to the challenges faced by a family historian as a conspiracy uncovering FBI agent). I felt like I inhabited both of these fictional characters' shoes when I made an astonishing find in Findmypast's Newspaper Archives, proving to me that with a combination of skill, determination and cunning, it really is possible to demolish long-standing brick walls. I'd complimented myself on doing what I thought was a very good job in obtaining a profile of my great-great grandfather, Daniel Crompton, through all the published censuses from 1841 to 1901. I learned that Daniel was born c1817 in a little village called Atworth (sometimes written as Alworth), Wiltshire. His father was Samuel Compton and his mother was the brilliantly named, Righteous West. So far, so good. I noted in the census up to 1861 his name appears without an 'R' (Compton) but from 1871 the name is listed correctly. But as we know, transcription errors such as this are quite common, so I wasn't too worried about that as all my other information fitted. I went on to discover that in 1841 Daniel had married Mary West of Saltford, near Bath (I don't know if there is any connection to Righteous West, his mother). They had three children. He worked as a gardener for a household and Mary worked as a servant (and some of the children also appear, listed as 'child of servant'). They seemed to move around frequently and appear living/working at different households from 1841-1861. However, in 1864 Daniel re-married to another Mary, this time Mary Davies from the Welsh town of Trevethin. Their marriage certificate states he is a widower. Because Daniel and his family, including his first wife Mary, are registered on the 1861 census as living at St Woollos, Newport, then presumably, Mary Compton (nee West) must have died sometime between 1861 and 1864 when he remarried. However, try as I might I could find no burial/death record for Mary, which troubled me a lot. I can see how one might get away with not registering a birth - but a death/burial should always be registered. My suspicions were aroused. Maybe she'd died while on a visit out of town? A wider search still yielded no death record. I like to be thorough because there's nothing worse for a genealogist than heading down the wrong trail. So I decided I'd confirm what I thought I knew about Daniel with as much proof as I could get hold of. I started by ordering copies of certificates for Daniel's two marriages. The plot thickened. His first marriage certificate (to Mary West in 1841) confirmed his father was Samuel Compton (a gardener). However, the certificate for his second marriage to Mary Davies (1864) said his father was William Crompton, a bailiff. How on earth could that be? At this point, the key points I needed to address were: Could this really be two families, not one? If it was two families, how come Compton's seem to disappear after 1861? Yet why do Crompton's appear only from 1871 (and not before)? Why is there no burial record for Daniel's first wife Mary? If it is the same family (as I always suspected), why give two different names for his father? I took a step backwards and painstakingly scrolled through every census, looking for both families. I made tables of where each person was at the time of each census and looked for differences. I expected to find somewhere along the way that I would find two entries for a 'Daniel' covering the same census, which would indicate this was indeed two families. However, I drew a complete blank in all respects. "What would Jane Marple do?" I asked myself. "She wouldn't give up," came the answer. It seems Daniel was a liar, a cheat, and quite possibly a bigamist. I found a news archive article from the Hereford Times dated 23 May 1863. It explained that Daniel Crompton, late of Newport was up in court with two women, Ann Jenkins and Susannah Boucher. Daniel was charged with 'Obtaining a Situation by means of a False Character' and Ann Jenkins with the same (but also with aiding and abetting) and Susannah Boucher was charged with causing and procuring letters to be written falsely, by means of which Daniel obtained the situation in question. The article is so very revealing. Daniel's downfall came from replying to a job advertisement for a man servant, coachman and groom for Major Wickham, of Pen-y-pound House, Abergavenny. It stated the applicant 'should be of honest, trustworthy, reputable character'. Daniel gave his reference as the Rev Wm Thomas who lived in Newport. Unbeknown to the Rev Wm Thomas, it was actually Jenkins who gave Daniel a glowing reference, leading to him getting the job. A few months later, Jenkins, who represented herself to be Daniel's wife, applied for a position as in-servant at Major Wickham's home. Again, she gave her reference as the same Rev Wm Thomas. However, as the correspondence ensued, some suspicion crept in ending with Major Wickham contacting the police. I found three more articles where Daniel was in court, and convicted of theft (of lead, a coat, and wood). His name also crops up in other cases that paint him in a highly dubious light. So, here we have a man not adverse to lying and cheating. Published in May, 1863, the article confirms his first wife Mary was still alive then. He would have spent three months in prison, taking us to late August 1863 when he would be released. Around nine months later he was marrying my ancestor, Mary Davies in Trevethin. My gut feeling is that, having pilfered his way through various villages in the region, he moved on to Trevethin. Further research led me to suspect this family may have had a little cash behind them, and believe, in order to try to look a bit more respectable and to help cover up his past, he added the 'R' in his surname Compton - making the name Crompton, and to impress his family-to-be, said his father was William, a Bailiff - a decent position of some authority. Daniel married Mary Davies bigamously. Having scoured the records, there is no burial record for his first wife, Mary, and from what the article said it looks like she might not even have seen him for a long time because he was co-habiting for a number of years with Ann Jenkins. I don't think for a minute he would have given a second thought to falsifying his own details for his own benefit. Lucky for him, news travelled very slowly in those days with no social media to help anyone out the dots together. I hope you found my story interesting, and that it helps inspire you not to give up when you encounter your own brick walls. Stuck right now? Scour these valuable archives. 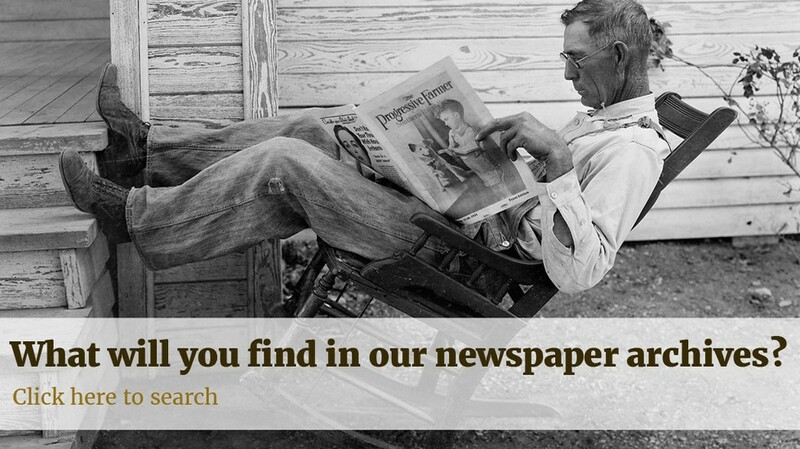 If, as it's said, 'Genealogists provide the skeleton,' and 'Family historians put meat on the bones' - then the newspaper archives can help show you the 'Heart and soul' of your ancestors.